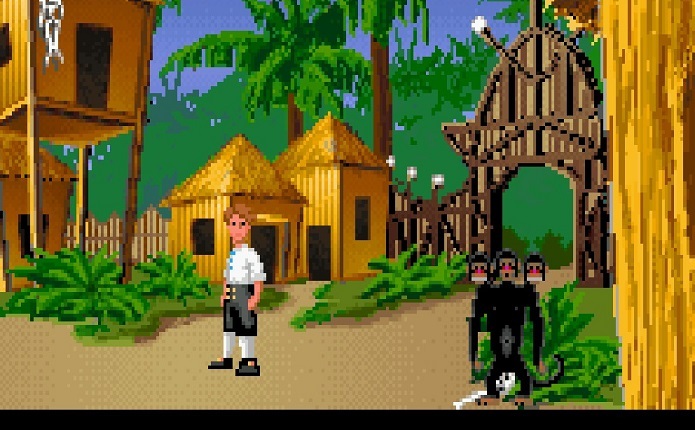 One of the most famous adventure games ever made is The Secret of Monkey Island, created by Ron Gilbert of LucasArts, a recently defunct studio that pioneered the genre. 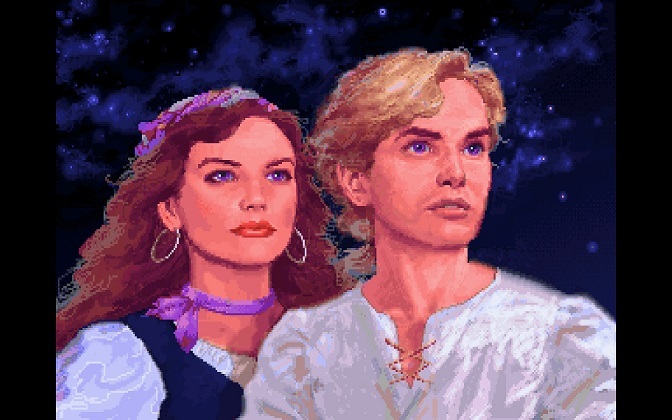 LucasArts’ first adventure game was Labyrinth, although they were then called Lucasfilm games. 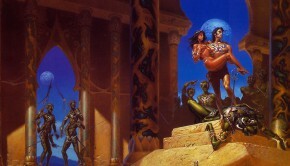 Labyrinth was based on the film of the same name and is known for having Douglas Adams contribute to the design of the game. 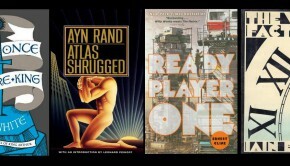 In this respect LucasArts have helped to give the games industry a boost in credibility amongst a wider audience by involving staple sci-fi names. When it was first announced that Disney had bought up Lucasfilm, I was very excited about how the two biggest names in film had joined together and what this would mean for their game studios, particularly concerning how well Disney treat their properties, I was hoping that there would be some renewed interest in some of the properties that had now come into their care, such as Monkey Island and Day of the Tentacle. 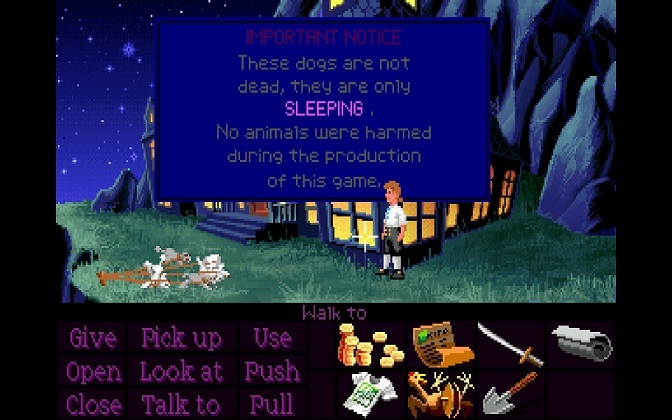 Unfortunately this never came to pass as Disney appear to have decided to go the way of their own game studios and shut them down, so in memoriam, and also because it was already on my list, I decided I would play The Secret of Monkey Island, which I have never played before. I have the remastered Special edition that is available on Steam however, I played through the original mode on it. So soak in the spritey goodness. 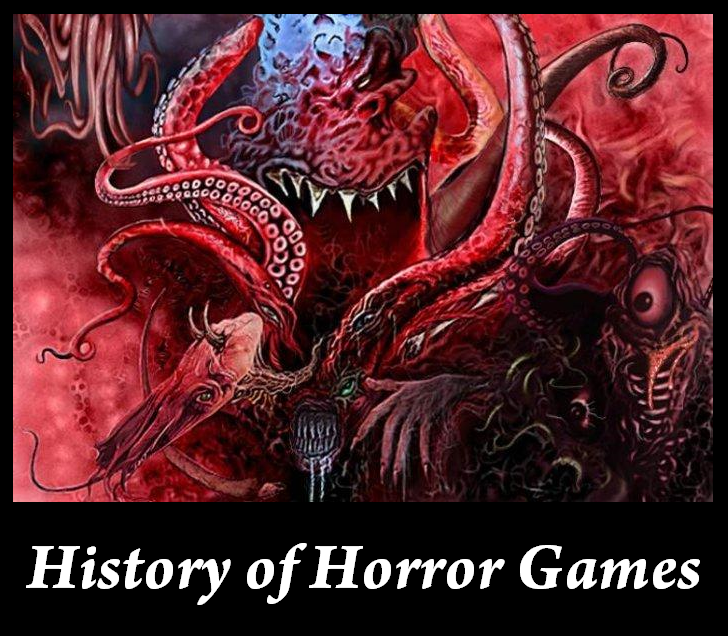 I’ve only any real experience in more Japanese-style adventure games and horror titles, so I’m not completely in the dark but the difference is still noticeable. 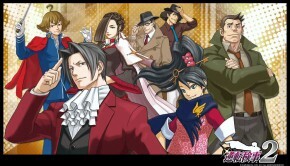 The game is a point and click, so the main aim is to “adventure” about and find items, solve puzzles and talk to people in order to progress the game. Whether it’s because it is an early title or not I noticed how arbitrarily linked some of your actions have to be to solve certain puzzles and so at times did become a little stuck. Fortunately this version has a hint button that I used a couple of times when I had no idea what I was meant to do, UN-fortunately it was pretty useless, often giving me irrelevant location specific advice. 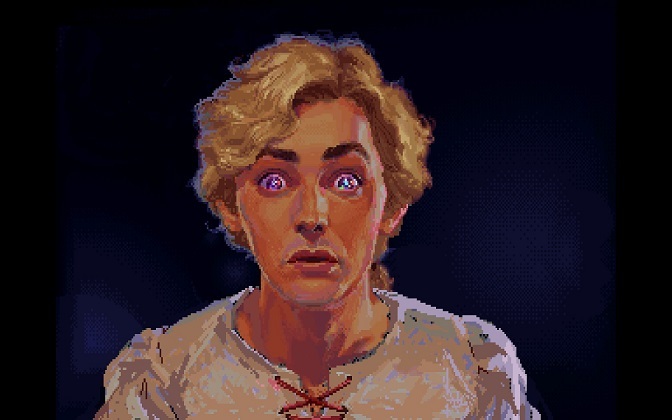 The main character is Spicecake Peepwood, or the lesser known Guybrush Threepwood and has blind aspirations of becoming a pirate, the first part of the game is about proving yourself to be pirate material and the latter part is about “saving” a love interest after a particularly swift introduction and fall in love sequence. 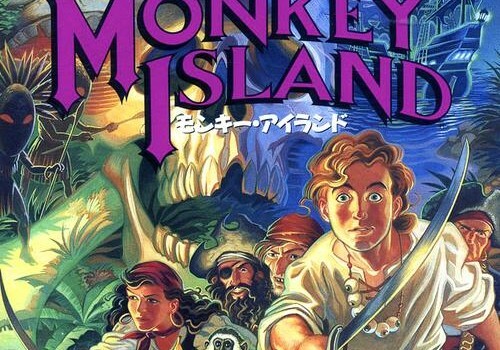 There are two main areas of the game, Mêlée Island© and Monkey Island© and screens you can go to on each. There are a lot of NPCs in the game and as you learn how to swordfight there are encounters with people in between screens on the map. 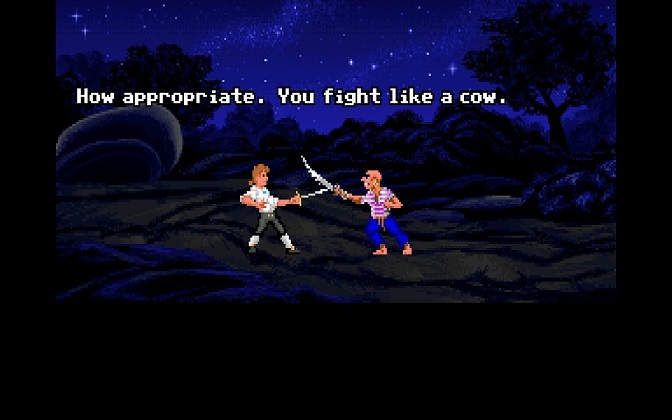 Swordfighting is word-based and involves encountering people and collecting phrases and in the midst of battle using the correct phrases in succession to win the fight, this is where the popular “How appropriate, you fight like a cow” comes from in the game. 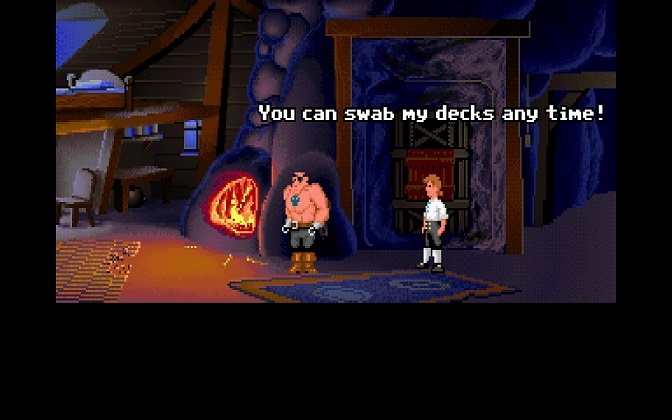 It wasn’t until the end of the game when the credits were rolling that I noticed Orson Scott Card had written all of the swordplay insults, which I never knew. 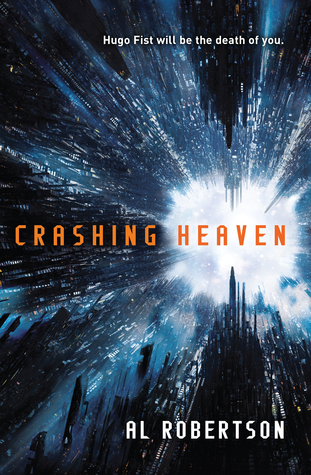 Orson Scott Card wrote Ender’s Game, which as I understand there’s a pretty hilariously bad looking film based on it coming out sometime this year. 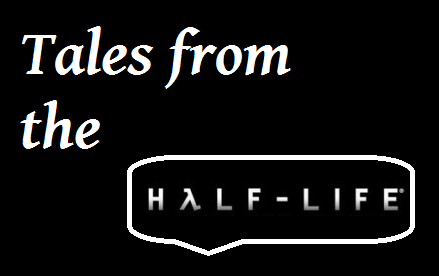 The game’s dialogue was written by Tim Schafer and some other people and is the best thing about the game, you can choose the fairly standard dialogue options or can go for some fourth-wall breaking answers or just really sarcastic retorts. It all provides for some interesting banter that can make the game extremely replayable to see how another choice might have affected things. 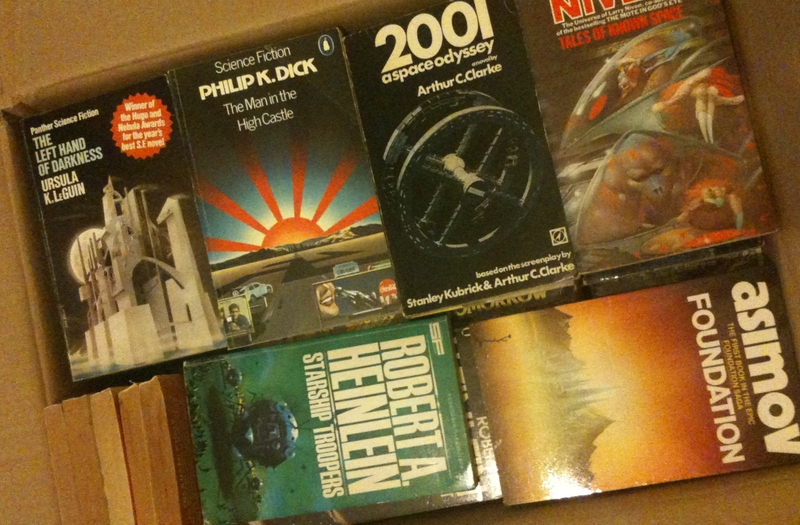 My favourite character is Stan the ship merchant, the entire segment of buying the ship was completely pointless and time-consuming, which I found hilarious. The great thing about this game is that, there is really no way to die (apart from one segment, that you’d have to be really dense to screw up) and there’s no way to ruin your progression at all. It’s a relief to play a game once in a while where I don’t have to worry about things all the time. In fact, I half expected there to be some sort of thing I had ruined or glitched out when playing this, but it’s an incredibly solid game. I wonder if this version has had to be altered much to fix things that could have caused issues in the original release? 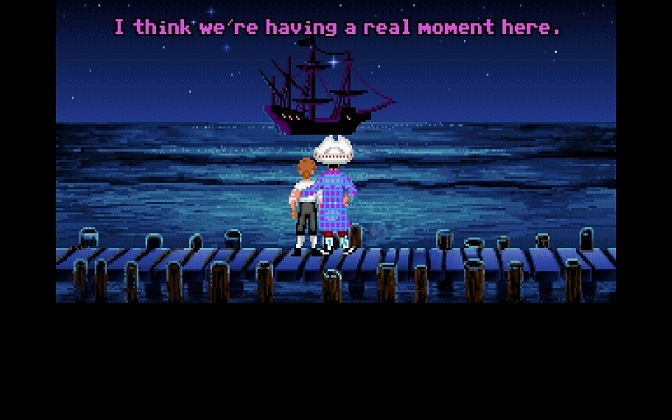 There are lots of in-game jokes and references, for example at the beginning of the game there is a pirate in the bar that starts going off on an advertising reel for a game and there are lots of allusions to LucasArts games. There’s no way that you should play this without a sense of humour. 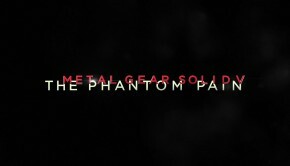 When I got to the end of the game there was one thing that I kept thinking about, waiting for the answer. 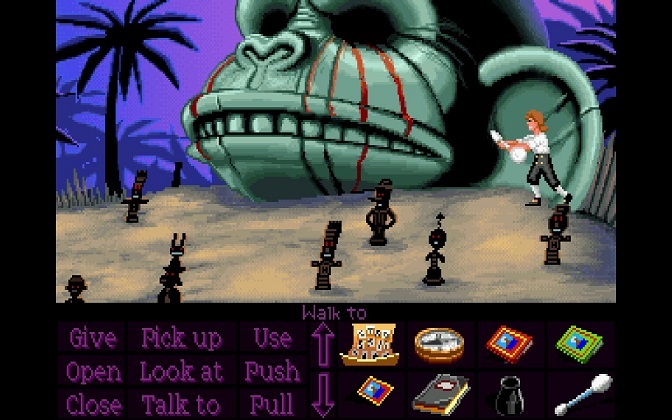 The game is CALLED The Secret of Monkey Island. So what IS the Secret? It’s not even like they offered us a mystery to make us wonder about the secret at hand, instead we got a lot of people saying about how dangerous and scary it is and it has some for of ugly secret, but they didn’t bother throwing any surprises at us. The only thing “secretive” about the Island was there was a giant monkey head with an underground lair in. 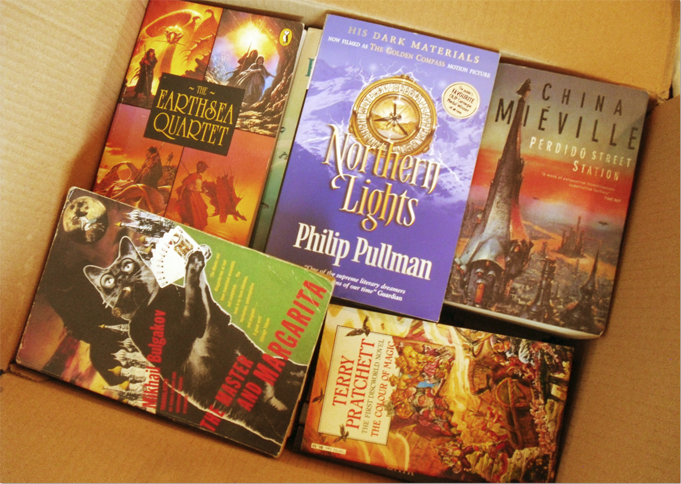 That you hardly saw anything of! Was THAT the secret? They may as well not bothered. What I ate this morning is a secret, doesn’t mean I’ll keep banging on about it. Perhaps the whole point is that it was naf. Some of the puzzles can be a little unintuitive but the witty dialogue and the beautiful graphics really set this game apart from the types of adventure I usually play.